The Tubbs fire completely destroyed the home of the Peanuts cartoon strip creator. 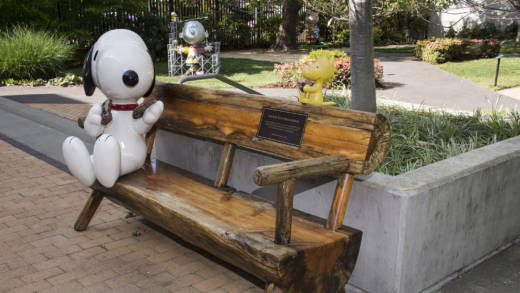 But while the flames came close to the Charles M. Schulz Museum, they did not damage it. The gallery and education space dedicated to the famous cartoonist’s work was able to reopen its doors on Sunday. "We were evacuated and lost power, but otherwise the building was OK," says museum marketing director Tracey Pugh. Pugh says more than 160 people visited the museum opening day and that she and her colleagues are now focusing on their first major post-fire event, happening next Sunday, Nov. 12. "It'll feature Snoopy and Peanuts," Pugh says. Also in Santa Rosa, the Luther Burbank Center for the Arts is returning to programming this Thursday, with Shopkins Live! -- a family-friendly musical based on the popular children’s toy. And elsewhere in wine country, the Napa Valley Film Festival is going ahead. The annual cultural event happening this week is one of the region’s biggest, as well as one of the first of its size to occur since the fire. The nonprofit festival plans to donate 10 percent of past sales to the Napa Valley Community Foundation Disaster Relief Fund. And a festival sponsor is planning to donate 1,000 free movie tickets to fire victims.